One year old shoots often go pretty well. I don’t want to jinx myself, but there’s a few reasons they seem to really work well. At around 1, a baby is more independent and can entertain themself at least for a little while. And they are not yet at an age where they have a lot of attitude and push back. So when I turn up with my camera, most of them are eager to play with me and my lens. To see another session with a sweet one year old gal, check out this family photo session at Jeffrey Open Space Trail. My session with this sweet trio was no different. Sweet little Baby A couldn’t stop looking right at my camera to begin with. His beautiful curious blue eyes wondered what all the clicking was about, which made it almost too easy for me. Then all we did was hang about in their beautiful Huntington Beach abode - played in the bedroom, explored the backward and read a story. As far as 2019 goes, this family photo shoot sets the standard pretty high for the rest of the year! I hope you’ve enjoyed viewing this photo session. 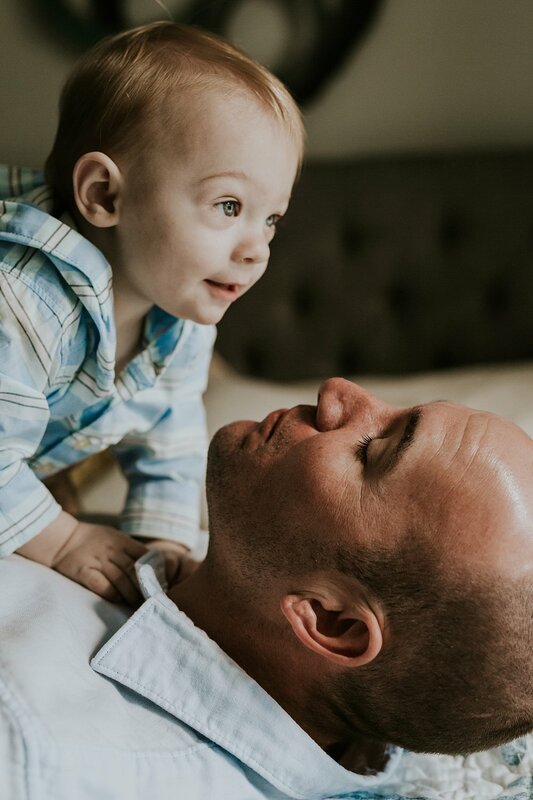 Krystil McDowall is an Orange County family photographer, specializing in photography for families of all shapes and sizes, which includes couples, expecting parents, newborns, toddlers, kiddos, even bigger kiddos and, of course, any fur babies that schlep with the family. If you're interested in knowing more, check out my portfolio or contact me so we can discuss documenting some memories together. Also, be sure to follow my Instagram for my latest work.